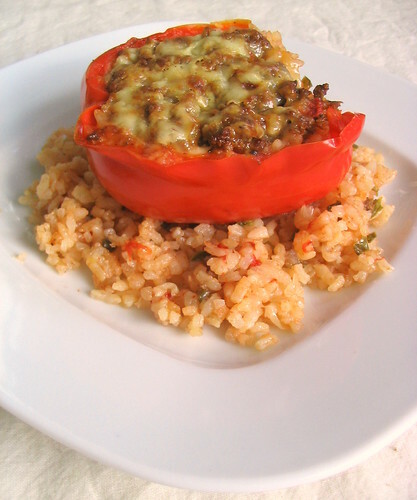 I don't know about you but the classic stuffed bell pepper with plain rice and ground beef sounds a little... bland. So here's a twist using Mexican rice and spicy chipotle beef. I was very reluctant to use the word Tex-Mex because oh god it makes me think of Taco Bell but calling these Mexican stuffed peppers would be a misnomer because a Mexican stuffed pepper, or chile relleno, is something else entirely (a roasted poblano stuffed with cheese and deep fried). Anyways, naming technicalities aside these stuffed peppers are anything but boring. Preheat the oven to 350 degrees F. Have your Mexican rice cooking or precooked as you start this. I like to leave the rice a tad undercooked so it can finish cooking in the oven as it bakes in the peppers. Heat a tablespoon of vegetable oil in a skillet over medium high heat and brown the ground beef. Drain all but 1 tablespoon of the fat. Return the skillet to medium heat and add the finely diced onions, chili powder, and cumin. Cook until the onions are soft and translucent. Add the minced garlic, chipotle peppers, and adobo sauce and cook until the garlic is fragrant, about 30 seconds. Season with salt and pepper to taste. Then add the chicken stock or water and simmer with the lid slightly ajar until most of the liquid evaporates. Set aside for stuffing the peppers. There are 2 ways to prepare the peppers. You can either cut the tops off and scoop out the pith and seeds for 4 large stuffed peppers. Or you can cut them in half lengthwise for 8 half stuffed peppers. Whichever way you choose to cut the peppers remove all of the seeds and white pith. Bring a pot of water to a boil and boil the peppers until they are slightly soft, 3 minutes. Then rinse them under cold water so they are easier to handle. Stuff each pepper with some rice, then beef, and top with shredded cheese. Bake in a 350 degree F oven for 25 - 35 minutes or until the peppers are soft. If you wish, double the recipe for extra rice to serve on the side. Rinse the rice then let it drain in a sieve. In a food processor or blender, puree the drained canned tomatoes, onion, and garlic. Add some of the drained tomato liquid for the puree to equal 1 cup. Heat the oil or lard in a saucepan or dutch oven over medium high heat. Add the rice to the hot oil and stir. Toast the rice in the hot oil for about 5 minutes. Then add the jalapenos, tomato puree, and chicken stock. Scrape up anything stuck to the bottom of the pan. Bring the contents up to a boil then lower the heat to a bare simmer. Cook for about 15 - 20, or until the rice is cooked through and tender and the liquid has been absorbed. If you plan on stuffing it into peppers, leave the rice underdone so it can finish cooking while the peppers cook. Fluff with a fork and mix in some chopped cilantro if preferred. Oh yeah! this my kind of food! I could dig into this stuff anytime. Love it! These will definitely go on my Super Bowl menu! Can't wait to see what's brewing!!! Keep up the great work!!!! I loved stuffed peppers so will have to give this twist a try! Texmex stuffed peppers do sounds tasty! There's a lot going on right now but I'll get everything done I promise!